In my previous blog post, I wrote a recap about my 2014 major events along with some 2015 resolutions. One of my resolutions that I neglected to mention was that I wanted to be closer to Him. By Him, I am referring to my Lord and Savior, Jesus Christ. Not so much as to a specific religion, I do identify with being a Catholic though, since I went through the required sacraments. I just wanted to grow in terms of knowing and studying the bible. I have the worst attention span when I attend mass, so although I am present, I'm not always paying attention. Not to long ago, a friend of mines referred me to the website and app of She Reads Truth. 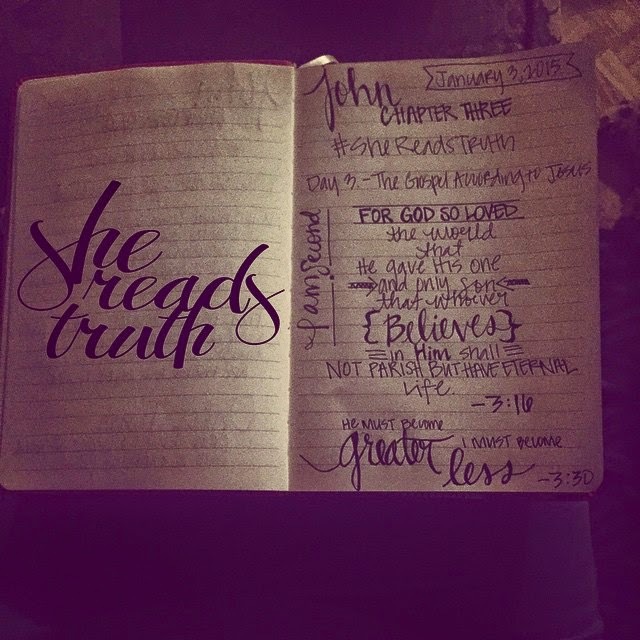 She Reads Truth ( #SheReadsTruth for social media) is a daily devotional app/blog with in-app purchase plans that let you study the bible with THOUSANDS of other women around the world. For the next few days 19 days, I will be studying and reading scripture with many others that purchased the John plan. It started back on January 1st and runs through the 25th of this month. I love reading how others feel connected to a certain verse of the specific chapter we are currently studying. One of my favorites is Chapter 3 of the Book of John. I use the in-app NIV (New International Version) Bible, there are other versions like HCSB, KJV, and NASB. I'm also keeping a journal where I'm writing down my favorite versus. I find this the easiest way to memorize scripture, and also being creative. I can't wait to see how many journals I fill up with scripture this year. Do you participate or read the devotionals in the #SheReadsTruth app or website? Do you journal? If so let me know in the comments!